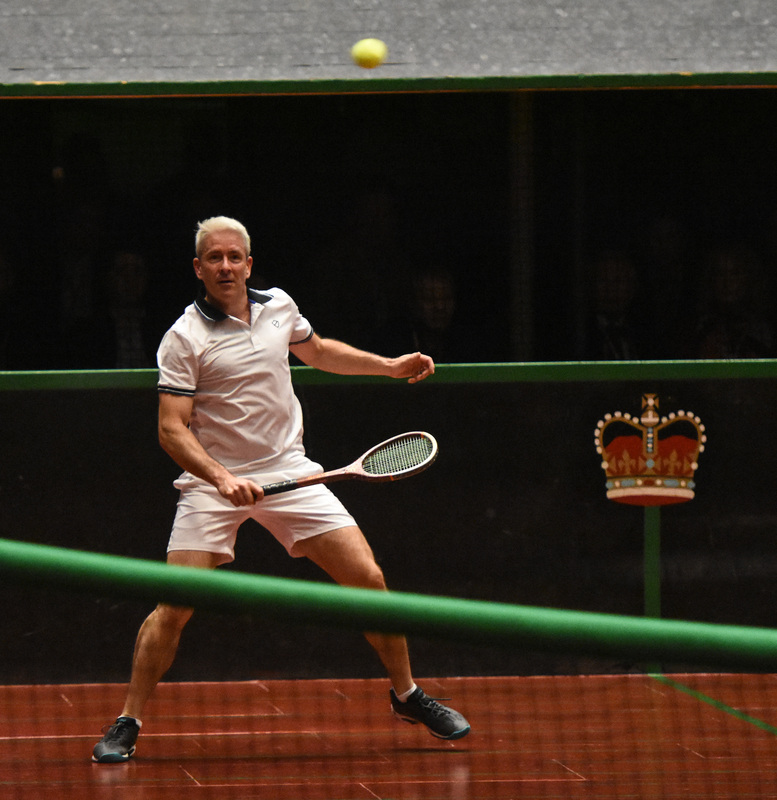 The IRTPA Championships (formally the UK Professional Singles) along with the US Professional Singles has a different format. 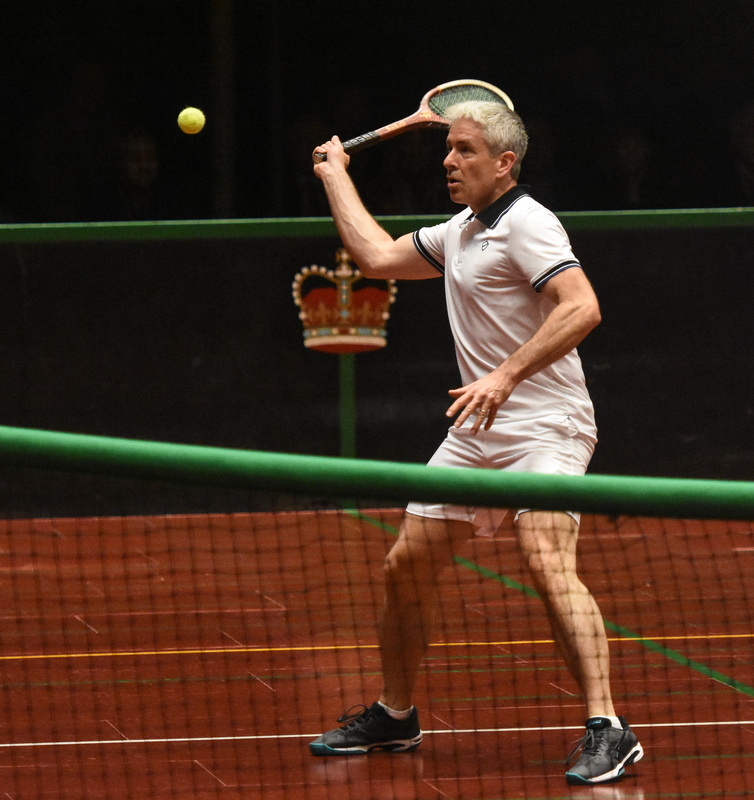 The top 8 players entering the event go straight into the main draw and the remaining competitors play in a Satellite tournament with 8 players qualifying to play in the main event. The difference though is the Satellite, although a qualifying event is played through to a final and this final is normally hugely competitive. 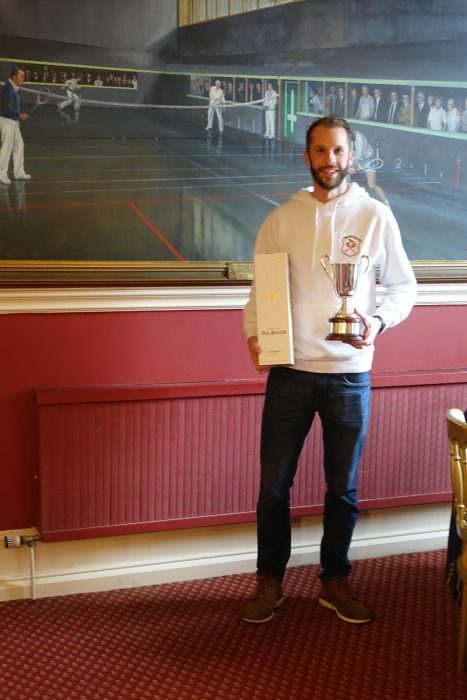 The Leamington Tennis Club were the hosts and they not only provided the sponsorship for the prize fund but they put together events during the week both on and off court which made this tournament hugely successful. 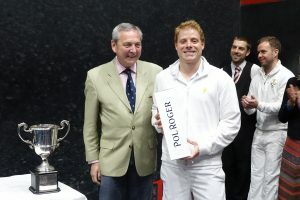 Pol Roger who supports tennis provided their champagne for a reception at the beginning of the week and also for the finalists of each competition and the markers. Not only great tennis at the top level but the best amateur handicap doubles run through the week. 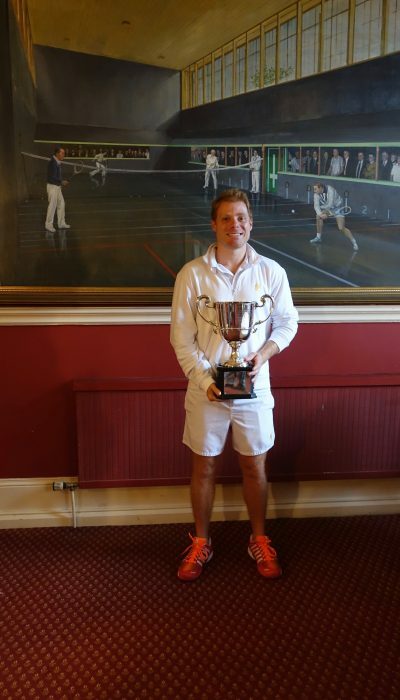 There was an innovation here created by Ben Taylor-Matthews, The Leamington Tennis Court Club’s Head Professional. Each pair had a professional mentor who gave team instructions, which were not always followed which added to the fun and competitiveness of the event. Indeed Camden Riviere and Rob Fahey’s teams did not get through to the knock out stages, not through their lack of trying! 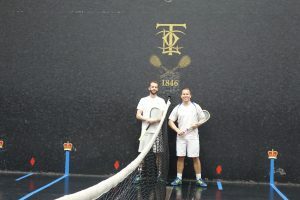 This event saw Conor Medlow, Head Racquets Professional of The Racquet Club of Chicago and Louis Gordon, Assistant Professional at Petworth House Tennis Court. Conor’s handicap is +1.8 and Louis’ is -6.9 so on paper Conor should win. Conor definitely had a plan to win 6/0 6/0 and indeed the first set was 6/0 and he was 3/0 up in the second set but Louis was having none of it and took a game. There was a howl from Conor of “NO” and it was game on. Louis just does not give up and he put pressure all the time on Conor. 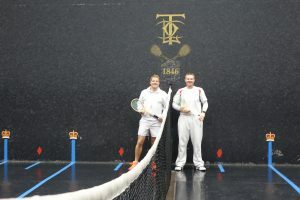 It was superbly competitive set and showed both players at their best. 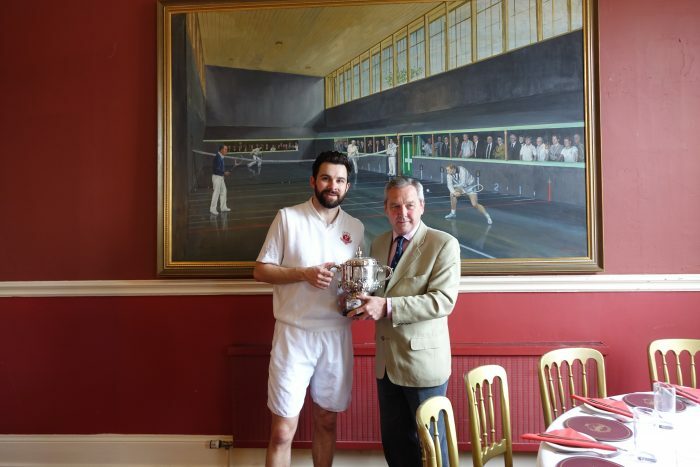 Conor won his first tournament as a professional 6/0 6/4. 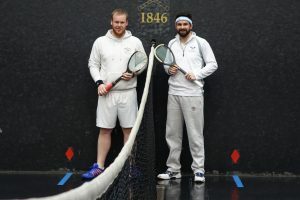 It was played between Darren Long, Assistant Professional at The Manchester Tennis & Racquet Club and Tom Durack, Senior Professional at Petworth House Tennis Court. This was a hugely competitive and entertaining final and with a score line to Tom Durack of 5/6 6/4 6/5 also a test of endurance and fitness. For Darren it was a huge disappointment as holder of the title and trying to win it for a third time. For Tom it was an achievement as he has been fighting injuries over the past two years and now he is back with a bang and ready to take on the ‘big boys’. What an event this was. 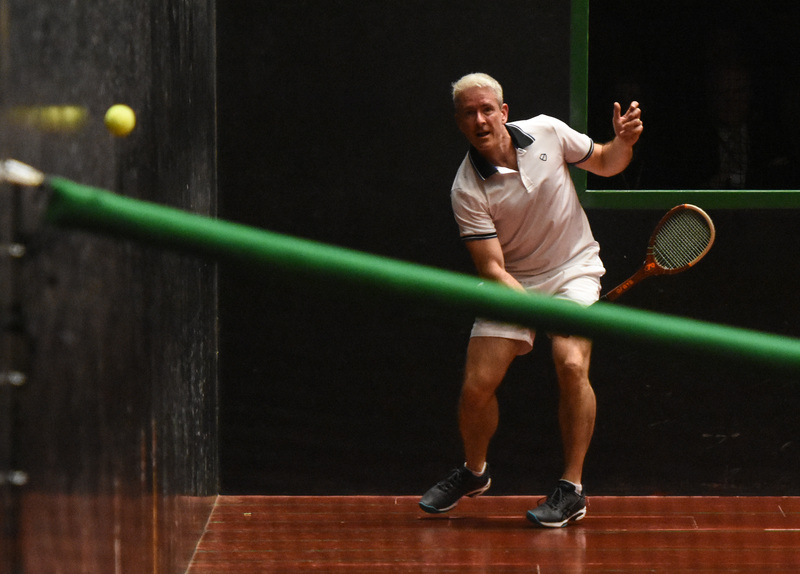 The semi final between Chris Chapman and Rob Fahey was “who was going to retire first” Chris was not well and Rob damaged his wrist. No player has defeated Camden Riviere in a ranking tournament (excluding the World Singles) since the Australian Open Singles in 2013. 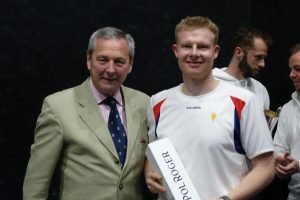 He is the World Singles Champion and World Doubles Champion retaining this title with Tim Chisholm having been 0/4 down after the first day of play by their winning on the second day all of the remaining 5 sets the previous week. 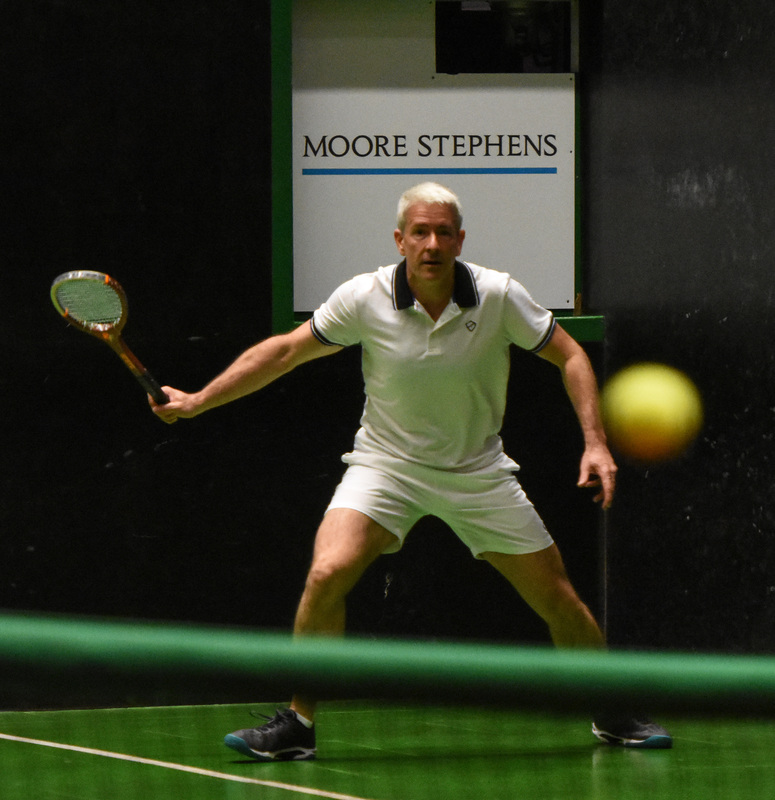 The final was played between Camden Riviere and Chris Chapman, who now over the bug he had during his semi final would be able to find a weakness in Camden’s game. Interestingly, both players used the railroad as their 1st choice of serve but with a difference. Camden stands precisely on the chase 3 line and after finishing the stroke is at chase 3 and 4. Chris starts his railroad at around chase 2 and 3 and finishes his stroke at chase 3. Camden’s was the more effective serve. Is there something to follow in this? Chris was in fine form and Camden was ‘testing’ Chris for the 1st 4 games with a score line of 2 games each. Then like all champions Camden raised his game a notch and saw out the 1st set 6/2. The second set had Chris playing more cannily, there were many long rests but by on large Camden would win them and he took this set 6/3. The third set was interesting in that Chris tried to remain competitive but again Camden was not letting him into the set and Camden won the event 6/2 6/3 6/2 regaining the title he has won 4 times before. Camden will no doubt be after Rob Fahey’s record of 9 IRTPA Championship titles.